Visiting a school this week I saw the inevitable sign about exams being in progress. 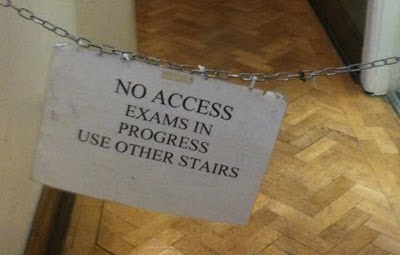 In fact, whenever I go into schools, I nearly always see a sign for exams of one sort or another being underway..... They take an increasingly large amount of time (and space) in a school life. There is a new focus from the Government on going back and increasing the number of terminal exams, as in the more traditional approach to assessment as one aspect of a strategy of improving standards. Just like I did when I went to school. We ALL want standards to improve, but I hated exams, (I'm not the only one) - and much preferred other forms of assessment where I always seemed to do better. The aspiration for increasing student success is fine, we all agree - there just have to be a combination of strategies to ensure measuring knowledge and skills really reflects what has been learnt.